The U.S. economy has been though the wringer over the past couple of years, and Gary Shilling, president of A. Gary Shilling & Co., says things aren't going to improve any time soon. In a video interview here at DailyFinance, Shilling warns that we should brace for more punches from the commercial real estate market and a slowdown in the Chinese economy as well as Japan, which he calls a "slow-motion train wreck." He sees bad news ahead for unemployment, the housing market and GDP growth and says investors should be very cautious. So where should you invest? You'll be surprised by Shilling's advice. 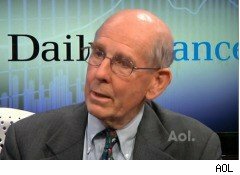 It's worth listening to Gary Shilling. He was one of the very first to warn about the dangers of the subprime market years ago and predicted that not only would the subprime mortgage market collapse, but it would also drag down the economy. Since his dire warnings, not only has the subprime mortgage market suffered, but the financial crisis hit Wall Street's banks, consumers stopped spending -- leading to a global recession -- and Europe now faces a sovereign debt crisis.